For many video game enthusiasts, playing EA Sports FIFA 17 is only a hobby, but now an increasing number of talented gamers are going professional. Fancy adding some Wolfsburg players to your Official Fantasy Bundesliga team? Make the most of unlimited transfers during the winter break! The Bundesliga's VfL Wolfsburg are global pioneers in that regard, and in May 2015 became the first football club anywhere in the world to sign an e-sport player when they recruited Benedikt Saltzer. They have since brought in two more players, adding Timo Siep and England's David Bytheway, as they look to spread the Bundesliga's dominance on the pitch to the interactive world. Saltzer and Siep have now qualified for the EA Sports FIFA 17 Ultumate Team Grand-Final in Berlin thanks to their performances at the Regional Championship in Paris on 4th February. Saltzer even came up against FC Schalke 04 representative Cihan Yasarlar in an all-Bundesliga final of the PlayStation 4 category. The Royal Blues representative emerged victorious on the night, but both clubs' players still progress as they look to make their way to the FIFA Interactive World Cup (FIWC17) in London in August. 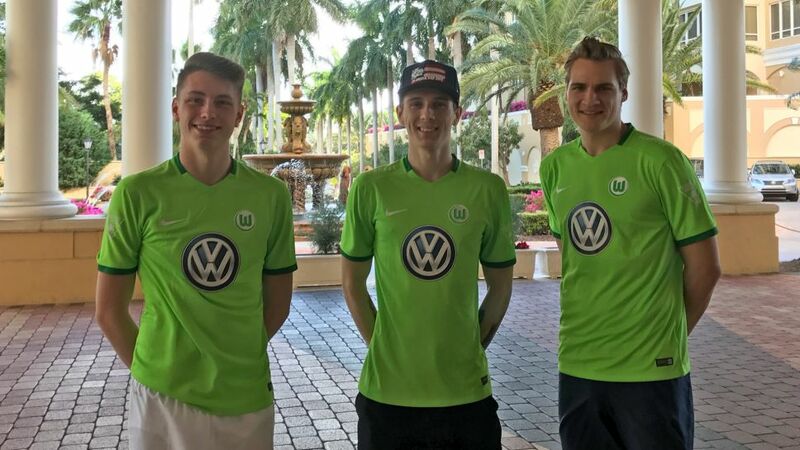 bundesliga.com spoke exclusively to Wolfsburg's gaming trio at the winter training base of the club's Development Squad in Sarasota, Florida, where the Wolves' reserve side competed at the Florida Cup 2017. "It was a bit of an accident that I started out in the scene," said 24-year-old Saltzer, who finished in the top eight at the FIFA Interactive World Cup (FIWC) in New York last year. "I played at lot of FIFA when I was younger and eventually I got bored of playing my friends because I always won. In Germany there are championships you can play in, so I just tried it and it took off from there." Bytheway and Siep followed similar paths into the sport, and their strong performances at tournaments – they respectively finished as runners-up at the 2014 FIWC and 2016 Electronic Sports World Cup – attracted Wolfsburg's attention as they look to strengthen in a rapidly growing area. Yet if becoming a professional gamer sounds appealing, it is not as easy as might first appear. Qualifying for the FIWC is open to anyone, but requires a commitment of playing across four consecutive weekends. "And you have to play 40 games each weekend," explained 23-year-old Bytheway. "I've calculated that that equates to about seven or eight hours a day. It is stressful. Realistically if you want to qualify, even with 37 wins every weekend your chances are pretty low." When they are not at their consoles or representing the Wolves at tournaments and events such as the Florida Cup, the trio go about their everyday lives as normal: the former two are still students, while Bytheway has a full-time job in marketing in London.